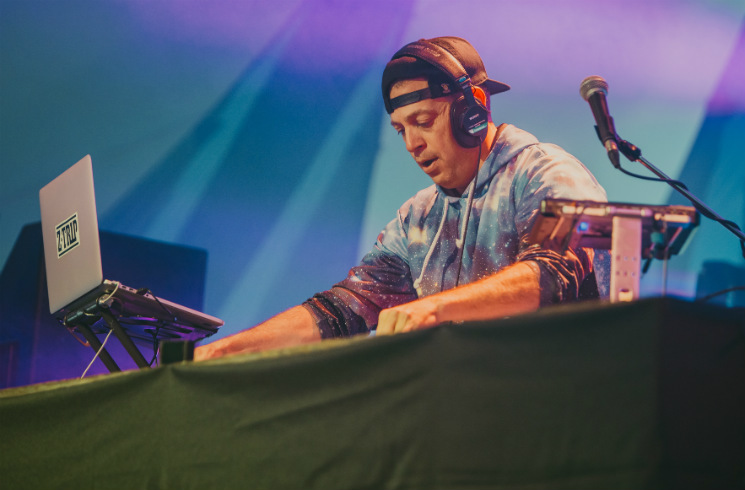 A technical glitch started off Z-Trip's set, but the New York DJ, recently landed, assured the crowd that in a mere two minutes, he'd have them flying. For those not in the know, Z-Trip is a world-renowned pioneer of the mashup movement, having been in the scene for nearly three decades. And the two minutes were worth the wait — right out of the gate, Z-Trip dropped into scratching, remixing N.W.A's "Straight Outta Compton." For those who were around, Z-Trip played Rifflandia's first-ever showing, and has now made his return for the festival's tenth anniversary. The appeal of his live shows is immediately evident — his skill and mastery are performed right in front of you: no programmed sets; no fluff. A scratch-heavy version of Dream Warriors' "My Definition of a Boombastic Jazz Style" was a perfect fit in the set, the Toronto hip-hop heavyweights having performed just one day earlier on the same stage. There's no style, no genre Z-Trip won't touch, which makes him entirely accessible — the last day of Rifflandia (September 18) at the park was themed "Under the Sea" and he delivered, dropping a bass-heavy mix of the Little Mermaid classic, which segued seamlessly into Missy Elliott's "Work It." A few glitches did plague the set (all electrical), but they were handled with grace, Z-Trip always picking up where he left off. Who else can move from Michael Jackson to Metallica, scratch throughout the latter's "One" and have everyone in the crowd jumping for more?